In the 1870s Britain dominated the coast of east Africa by informal influence exerted from Zanzibar through the renowned consul-general, Sir John Kirk. This unchallenged position ended with the decision of Bismarck to back Carl Peters in his treaty-making activities and the mainland opposite Zanzibar was partitioned in 1886 into British and German spheres. The British government was not willing to assume the responsibility and expense involved in administration of its area of influence and it assigned control to the Imperial British East Africa Company headed by William Mackinnon. The company's life was short and inglorious. The government attributed its failure to the ineffectuality of Mackinnon and the Company's directors blamed the government for using the Company to advance political objects and not providing it with proper support. Professor Galbraith's book considers this episode in British Imperial History, the factors involved and Mackinnon's part in it. 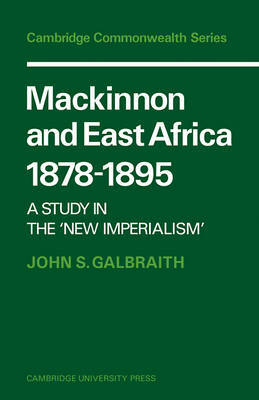 The book considers the interaction of Mackinnon and the government from the 1870s when his first efforts in east Africa were frustrated by Salisbury to the liquidation of the Company in the mid-1890s.